We can produce flat-belt brushes in any length requested, open ended or endless. They are mainly equipped with natural hairs or bristles, plant fibres or synthetic bristles. Depending on the fill material a brush surface from very soft to very hard can be obtained. 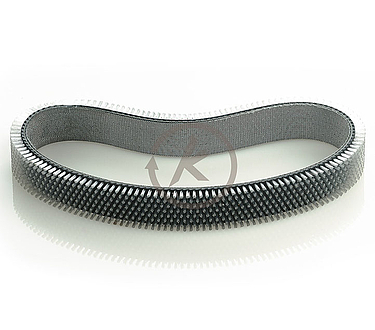 As belt qualities we supply the multilayered types 5,8 mm or 7,0 mm (belt thickness) with a cover sheet and running surface made of chrome leather and an integrated polyamide insert. They are suitable for temperatures from -15°C to +80°C. When using endless closed belts, belt pre-tension is an important factor.For our types 4,8 mm to 9,5 mm we normally use a belt pre-tension of 1,5 to 2% of the distance between the pulleys (a). In order to obtain this we recommend that an adjustment device (such as a slot) is used with an adjustment range of 5% of the distance between the pulleys (a). Please ensure the diameters of the deflection pulleys (d) are correct in order to obtain an adequate looping of the belt. We advise you to consider the following limitating values: for a belt width (KB) up to 50 mm the min. pulley dia. (d) is 80 mm, KB up to 100 mm = min. pulley dia. (d) 100 mm, KB up to 200 mm = min. pulley dia. (d) 150 mm. When mounting the belt drive horizontally the driving pulleys must be placed in trapezoidal or convex shape where the convex or conical camber of pulleys up to 200 mm = 1,0 mm and over 200 mm = 1,5 mm.